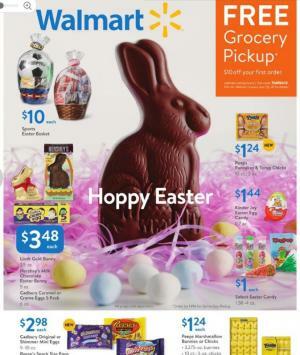 Marketside asparagus, whole carrots, fresh green beans, and more products are the first-page deals of Walmart Ad Grocery Sale Mar 29 - Apr 13, 2019. Buy 7" Carrot cake with cream cheese icing for only $5.98! Free grocery pickup for your first order at Walmart. Buy sweet foods like apple pie at Walmart this week. 8" Apple pie will cost only $3.98. Easter desserts are the delightful range of the latest sale. Betty Crocker rich & creamy frosting is $1.50 only. Hershey's or Reese's Easter candy of 11 oz. pack is $2.98! Have your breakfast with foods that are nutritionally rich and delicious. Oui French-style yogurt of 4 pack will cost $4.77! Marketside muffins are excellent quick breakfast choice and it will cost only $4.98 for 4 ct. Donut shop coffee is only $14.98! Also see Walmart's dinner ideas. Traditional Rotisserie chicken of 29 oz. pack. 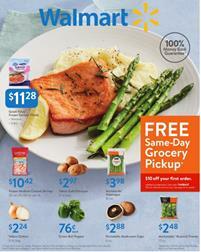 Make delicious chicken and seafood dinners and save with rollback deals. Save $1.10 on Super Colossal raw EZ-Peel shrimp. Using only chicken thighs and vegetables you can make the most delicious meal for only $2.32 at Walmart. Buy fresh vegetables and vegetable trays on pg 6. Rollback savings are also the deals on some snacks. Cheetos puffs or Ruffles will cost $2.50 only. Chips Ahoy! cookies of family size pack is a $.58 saving. You can buy useful kitchen appliances to cook wonderful food. 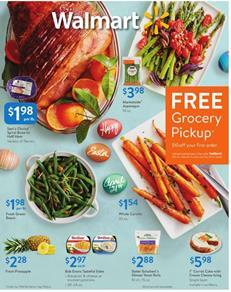 Cookware set, Keurig K-Compact brewer, Oster Classic Blender, and more are available in the latest Walmart Ad. A lot of them are great deals and rollback savings. Follow our Facebook page to get these on your feed. You can subscribe to get emails about the savings from the future ads. Same-day grocery pickup is one of the best services of Walmart other than its top deals from the weekly ads. Walmart has quite a good range of products of grocery. 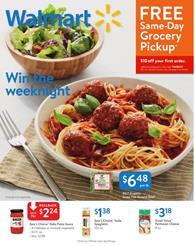 Make spaghetti and meatballs, salad with chicken, and have a look at the prices of Great Value products or the items that are necessary cooking. Breakfast foods are also on sale. For example, Pop-Tarts bites, Great Value Canadian bacon sandwiches, Jimmy Dean meat lovers, and also new items from the breakfast sale. Buy subs from the deli dept. of Walmart this week. See the prices on pg 4 where you will find American grinder sub, multipack chips, Hormel Natural choice deli turkey, and more of the delicious foods are in the range of deli from the Walmart Ad Preview. Discover the packaged mixed vegetables, fridge food, stuffed crust pizza, belVita biscuits, Buffalo Wild Wings fan fave sauces, and more products are available in the latest Walmart Ad. Having these in your stocks will feel comfortable for you will have access to instant food easily. Never miss out a deal from Walmart by a simple free subscription. Seeking a natural way to care for your health is not very hard. Walmart brings great products like Sky organics castor oil, eyelash serum, lip balm, lip scrub, liquid soap, and more items in the beauty part of the health-care section of the Walmart Ad. Also, browse the exclusive products on the baby care category. Hello Bello Lavender bubble bath, shampoo & body wash, baby lotion, and more products are available. Nutritional pouch, super puffs, infant formulas from Walmart's baby care category can be interesting. Also, pharmacy is a category that is worth seeing. Claritin allergy relief tablets, Equate sugar-free cetirizine syrup, Flonase allergy nasal spray, Quest Protein cookies 4 pack, and more can be seen in the pharmacy sale. You can also find nutrition shakes or beneficial health-care items on the same category of this latest Walmart Ad. It's easy to beware of the new deals from the store. Subscribe to the category, get emails whenever the updates come. 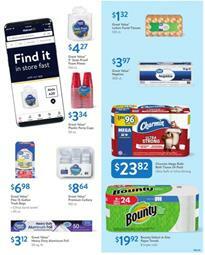 Shop your needs of household supplies for the prices of Walmart Ad. Go to pg 9 to browse household supplies like cleaning supplies and bathroom tissue. Charmin mega rolls bath tissue of 24 pack will cost only $23.82 this week. Bounty paper towels of 8 triple rolls will be $19.92. Save on Pure Balance dog and cat foods. Find big packs and get your pet supplies at a cheaper price on pg 10. Walmart Ad has the chemicals for laundry and cleaning on pg 11. Tide is a very popular brand of chemicals and you can find Tide ultra oxi for $11.97. That's a 92-100 fl oz. liquid or pods are available. Detergent tabs, disinfectants, wipes, and more can be useful deals for everyone who wants to shop for a better price. Walmart's range is really huge. 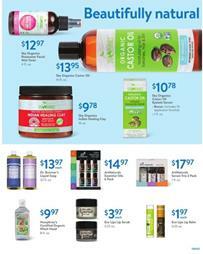 The ad also showcases the promotions of the deals on personal care products such as Burt's Bees toothpaste. Visit pg 12 for simple self-care and hair care items. Follow our Facebook page for more deals like these. We share the updates here and on our other social media accounts. Get a newsletter in your email by a subscription that is completely free. Get a $10 discount on your first order to pick up at the store for free. Use the code "TIMEBACK" to get the discount. Walmart Weekly Ad Food Deals Mar 1 - 16 featuring Portobella mushroom caps, marketside broccoli florets, yukon gold potatoes, marketside asparagus, yellow onions, which are available on the first page. This is a week at Walmart when seafood is a really special deal. Frozen fish variety is on sale and you can get really good things like Great Value frozen cod fillets at only $9.94! Shop shrimp, salmon, tilapia, and more products with the prices by Walmart Ad this week. The deals are effective until Mar 16. Shop fried chicken variety and packaged meats at Walmart stores. You can see the latest prices of Great Value wing, fried chicken, bratwurst, and Martketside pizza on pg 4. Party trays and platters are on sale. Nowadays, I don't know why, but "spaghetti & meatballs" is a really popular meal and people even make jokes about it. That's a delicious meal indeed. You can find the necessary ingredients for making spaghetti and meatballs. Also, find turkey taco bowl, chicken curry ingredients on pg 5.